If you’ve been to any one of our locations, you’ve likely seen a bowl of complimentary Zotz candy. 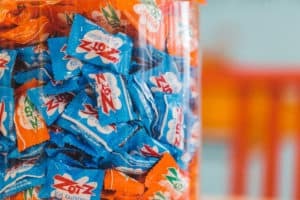 Zotz is the original fizzing candy creation introduced to the world by G.B. Ambrosoli in 1968 and became the highest selling candy in its category within the year. Decades before Pop Rocks, Zotz were big with the kids for their fun, interactive experience, and endless prank potential. These little throwbacks can be tough to track down these days, but they’re still in production by the very same Abrosoli family in Italy and distributed to the United States by Andre Prost. Every time we come across some inventory, we scoop them up to keep our bowls full and the story alive! The secret to Zotz timeless appeal is its surprisingly effervescent chemical reaction once bitten into. A combination of malic and tartaric acids mixed with sodium bicarbonate and water (read: spit) create for a fizzy, foamy, delightful tingle on the tongue. It’s a little sour, a little sweet, and packed with satisfaction. Like CarLotz, Zotz is all about the experience. And we love watching them make you smile. 0 comment(s) so far on It’s the little things….